1/4" HOT P.O. STEEL PLATE is precision Laser cut. HEAVY WALL D.O.M. PIPE for a superior load bearing member to ensure maximum stability. PRESSED IN STUDS, where others use welded bolts that lose a grade when welded. ROBOTIC PULSED WELDING produces an aerospace grade weld that is of a much higher quality than the short arc weld found on similar products. POWDER COATING that has been specially formulated for this product application. Paint just won't cut it! OEM FLAGE LOCK NUTS are included with every kit to ensure a proper torque spec. can be met on install. ILLUSTRATED INSTRUCTIONS are included with every kit to help with a quick and easy install. This kit will retain factory ride quality. Stock shocks can be used. No additional modification to the truck is necessary. Easily bolts onto stock strut mounts. A floor jack, two jack stands, and normal shop tools are all you need for installation. When choosing a lift kit for YOUR TOYOTA TRUCK accept nothing less than the highest quality. As always, every item is 100% guaranteed for quality and value! Customer satisfaction is our #1 goal! 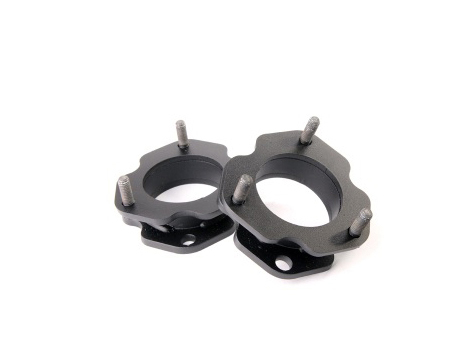 These are the high-quality spacers you’ve been looking for. You’ll be glad that you chose the very best product and service available! *Shown in picture 17" XD Hoss on Toyo Open Country Mud Terrain tires. From Andy of Albany, Ohio on 12/1/2013 .